This weekend, I will run my first postpartum race - a 10K that runs through my hometown and ends on the 50 yard line of my local University. It's also the race that holds my current 10K PR. I am excited but I would be lying if I said I wasn't nervous at all. There's just something about race day that brings around so much anticipation...there's nothing quite like it! I also have a few goals I've set for myself for this race which only makes the nerves a bit worse. This race will serve a few purposes...the main being a decent (hopefully) 10K time to post as a corral placeholder for Princess in February. I also registered for a back-up 10K that will be held the following weekend. I'm looking forward to both races, but I'm also glad to have the 2nd one as a "just in case" kind of race. I've also run both races before, which I think will help tremendously on race day. With my IT band giving me a bit of an issue during last week's planned 12 mile run, I am going to keep up the PT routine and stretching throughout this week. 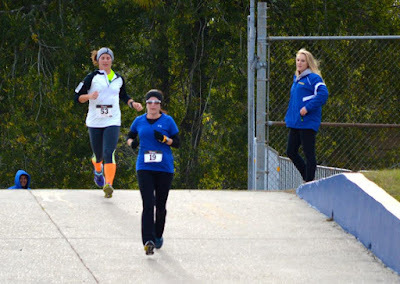 Thankfully, I ran 5.5 miles on Saturday and had no issues whatsoever. I'm crossing my fingers that it will be the same for race day! Although my 10K PR is right around 51 minutes and change, that was a couple of years ago. I've also had a baby and taken a bit of forced time off from running since then...so I don't think that setting a PR goal here would be feasible. However, running the race with my mile splits around 9 minutes each does sound obtainable. Ultimately, I would like to reach anything under the 1 hour range. Although my husband has to work and won't be able to be at the race to give his support, my parents will be there along with Brayden to cheer me on as I cross the finish line. I can't wait! I'm crossing my fingers that the weather is nice for Saturday! I am so excited that it's Friday once again! This week was full of fun activities and this weekend will be as well! 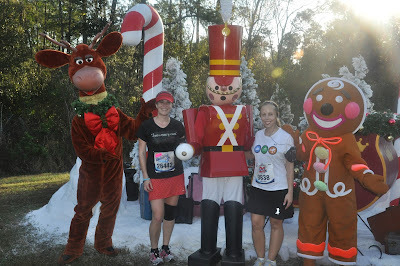 Last weekend, I set out to run a long run with my running buddy Heather. We had 12 miles on the schedule and somewhere around mile 5, my knee decided to let me know it wasn't very happy with me. To be honest, I haven't been doing my squats and lunges and PT routine like I should and my knee just isn't having it anymore. Needless to say, our 12 mile run was cut short at 8 miles. I was ok with the decision (and thankfully so was Heather) because our main focus is a 10K next weekend and we both want to have a good time for the race. After weighted squats and lunges and foam rolling all week, I hope the knee is back to being ok - we shall see on Saturday! Along with my knee, I also took a little break from running this week. I ate something on Monday night that left my stomach very unhappy with me. Needless to say, it all decided to revisit me the following morning and I've felt off all week. Here's hoping that gets better soon, too! By the way, Saturday was a BEAUTIFUL day with amazing weather! I want it to come back! This weekend, we also had the privilege of attending the Grand Opening for our church's Mother's Day Out program. Back in December of last year, our church experienced a massive flood (internally) which did a LOT of damage. It also wiped out our entire nursery/Mother's Day Out area. After a lot of time, restoration, and planning, the insides of the Mother's Day Out program is finally back to normal! They held an official ribbon cutting and celebration this weekend. 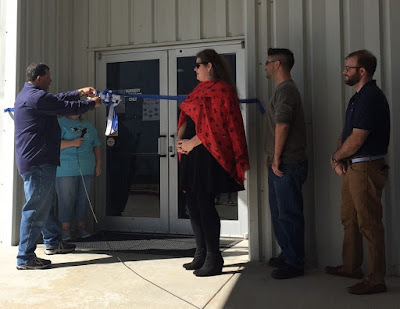 My dad even had the honor of cutting the ribbon! One side is themed as "Under the Sea" and the other is nature and local scenes! I LOVE it! They did an amazing job! Last night, we attended the homecoming parade for our local college. All of my family including my husband are alumni and it's fun to go back and support them during homecoming! Aren't Brayden's baby leggings just the cutest?! I loved his little outfit for the parade! Last year, we were about 4 months pregnant (she was 3 weeks ahead of me) and this year, we brought our babies! SO MUCH FUN! Brayden loved looking at everything - the only thing he did not care for were the crazy loud sirens. You guys. Oh my gosh. I still have no words...but you gotta admit, this one's pretty funny right here! There's a local car dealership here that "dresses up" their car wash every year for Halloween. It's actually rather funny and we decided to go check it all out for ourselves! Lined inside this tunnel were all kinds of Halloween themed items. I'm not a huge celebrator of the scary side of Halloween, but this was pretty funny...and a clever gimmick to get people to stop by and get their cars washed! This weekend is going to be another busy but fun one! I have a wedding shower that I'm helping host on Saturday morning. That evening, we are going to take Brayden (and his cousin) back to the pumpkin patch in their costumes for pictures (can't wait)! We also have the homecoming football game where we will be celebrating the birthday of another good friend of mine. In all, it should be another fun (and busy) one! Today, I'm teaming up with Running on Happy & Fairytales and Fitness for the Friday Five 2.0 linkup! As a POPSUGAR Select Fitness Blogger, I'm occasionally given the opportunity to review a monthly POPSUGAR Must Have Box. Each box contains around five items and sometimes has a few extras thrown in! October's box was filled with lots of things that remind me of cozy fall weather - hot chocolate, a coffee mug, brown sugar vanilla shower products just to name a few! This Henri Bendel umbrella is hands down my favorite item of the box! I love the size, portability, colors, and print of this umbrella. To top it off, it's a perfect fit for the middle console in my car. We haven't had a rain day yet, but I'll be prepared when we do! This Lalicious shower oil smells heavenly and feels just a smooth as it sounds. If you're a fan of brown sugar vanilla, you'll love this! Also, after doing a little browsing on their site, I see that they offer peppermint holiday sets. I might need this and I'm pretty sure it's going on my Christmas list...just sayin! Nothing says cool weather to me than a nice steaming hot cup of hot chocolate! I made a glass of this dark drinking chocolate by My Cup of Cocoa using almond milk and it was perfect! This dark drinking chocolate has a rich flavor and smooth texture - perfect for a nice fall afternoon! Ok seriously, how cute is this Morning Culture mug?! I also love the shape and design - it's perfect for an early morning cup of coffee (or hot chocolate)! I haven't had a chance to read this book yet, but it sounds like a really encouraging and uplifting book. From the description: An inspirational, upbeat memoir from POPSUGAR's founder, Lisa Sugar. Sprinkled with career and personal advice, encouraging stories, and tons of fun, this is one book you won't want to put down! My go to make up on a daily basis is a little base, some eye liner, mascara, and lip gloss. Up until this point, I hadn't used a liquid eye pen, but I really like this one by Revlon! It glides on smooth and has great lasting power - I'll definitely continue with this in my collection! Also included in this month's box were a few coupon codes - one to Henri Bendel and the other to Lalicious! In total, this box valued at over $150! If you remember my review from July's Must Have Box, a lot of the items in that box didn't pertain to me personally. However, I love the items from October's box and again, I love how each box has a different theme to it! Are you interested in trying out next month's PopSugar Must Have box? Click here, then use use code SHOP5 for $5 off your first Must Have Box! Disclaimer: I was provided a PopSugar Must Have Box in exchange for my honest review. All opinions expressed are my own. 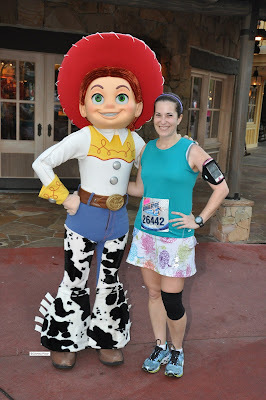 When I think back over the races I've run, my mind can't help but pick out a few "favorites". You know, those epic runs where you feel great the entire race, you're flying high over the finish line, and you're so excited to share the news of your accomplishment with your friends? 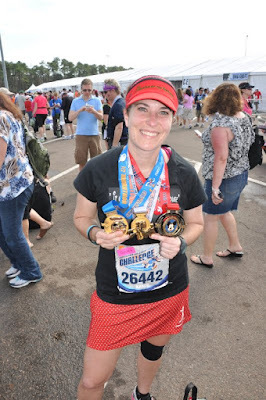 Well, I have a few of those races - one being my very first full marathon at WDW and the other being my first (and only) time to run Goofy's Challenge. I'll admit, I needed a bit of a break from back-to-back training long runs after completing Goofy's Challenge, but I've finally come around where I WANT to run this challenge again. For those who aren't familiar, Goofy's Challenge is a race experience at Walt Disney World where runners complete the half marathon on Saturday followed by the full marathon on Sunday for a total of 39.3 miles. The anticipating and excitement in the air at the expo was just what I needed to get the weekend started off on a great note! The Christmas scene is hands down one of my favorite race photos ever! 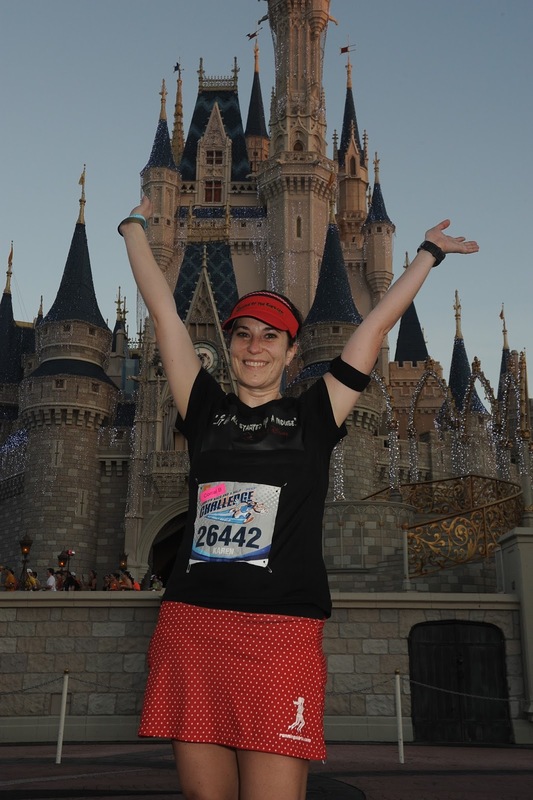 To top things off, runDisney was celebrating the 20th anniversary of the marathon that year, so the medals and merchandise were extra special! 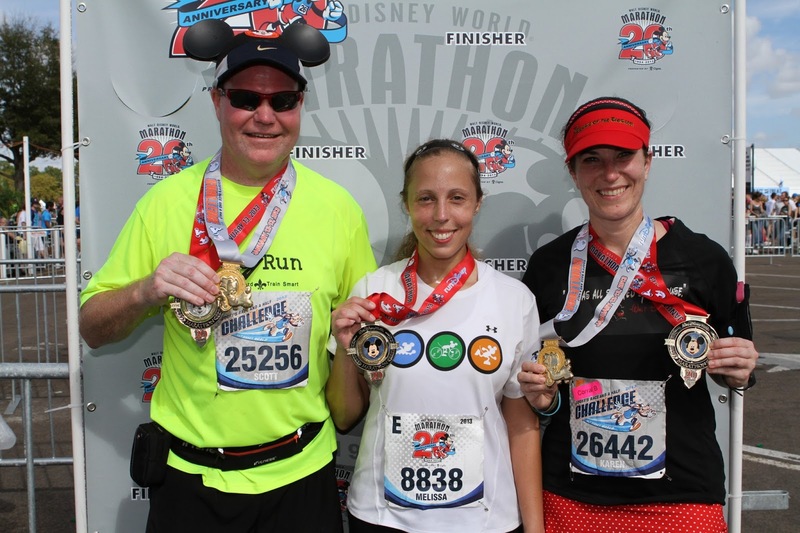 I completed Goofy's Challenge with my running buddy Scott (he's in my running group here at home) and my friend Melissa ran the marathon with us! Did you have an epic race experience - one you wish you could revisit? 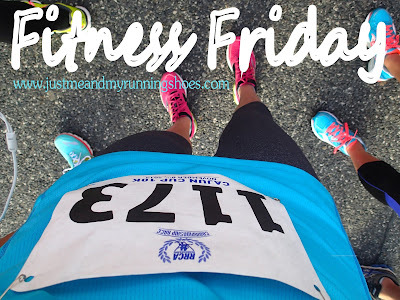 Today, I'm joining in with the above mentioned ladies for the Tuesdays On The Run link up! Click the photo for more! On Friday, Jason and I took Brayden to his (and our) very first pumpkin patch! 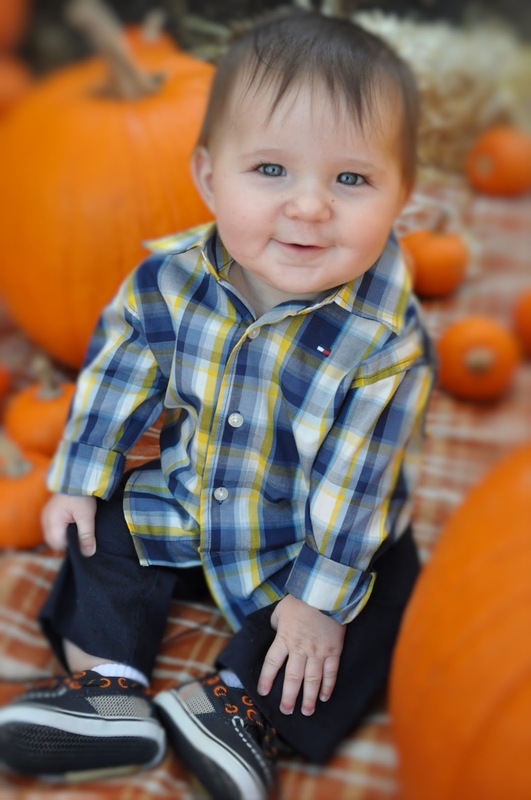 I grew up not far from this pumpkin patch and used to pass it every day on my way to school, so it was fun to bring my baby this year for pictures! Entry into the pumpkin patch was free and the profit from the pumpkins sold were to benefit a local food bank. I absolutely LOVED all of the cute little spots for photo ops! There were several photographers out and about taking pictures as well. I took one of Brayden here and I think it will be fun to compare the pictures from year to year! He was slightly confused as to what was going on! Hah! This was a fun experience and I'm so glad that something like this was/is offered here! So much fun with our little pumpkin! Are pumpkin patches popular where you live? Hello and happy Friday once again! The weather forecast this weekend promises for a beautiful one...so I'm crossing my fingers it stays true! This week was a great one here! On Saturday, my friend Heather and I went out for a 6 mile run. Nothing exciting happened, and the miles flew by while we talked. That always makes for a great run! Sadly, my running group is disbanding in January. Yes, this is the SAME running group I joined when I began running 7 years ago. It will definitely be bittersweet to say goodbye. I've heard talk of plans for other groups forming, so we will see what happens! Heather and I pretty much know the routes well and we know the water stops around town so I think we will be alright...it's just sad to see our group leave and have to say goodbye. Brayden's 6 month appt with his pedi was on Monday and he was given the green light to ride along in the BOB while we go for a run! This made things MUCH easier as far as adapting to my husband's work schedule and afternoon runs. It was super easy to put together, too...I'll share more about my thoughts on the BOB in a blog post next week. I wasn't sure what Brayden would think of the stroller, but he loved it and the gentle rocking motion helped him fall right asleep! Win win! I went out for another run with him last night - this time for a legit, real run to see how he handled the BOB. We made three miles which was awesome - in the walking stroller, 2 miles was usually his limit. I'm definitely looking forward to more training runs with Brayden now that we can be more flexible with the jogging stroller! Have a fabulous weekend! What are your weekend plans? Anyone running a race? If so, where? 6 Months, Pixie, and Walking Spree! 8 Mile Run and Zombies!